[Actually made this cake nearly a year and a half ago!] Browned butter adds a hint of nuttiness to this cake without adding nuts. Because this cake is made with the sponge technique, rather than a creamed-butter-and-sugar one, it’d be drier without a syrup, so I’ve added that as well. 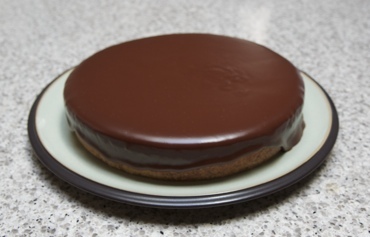 Also, because three is such a nice number for combining different flavor procedures, I’ve topped the cake with a chocolate ganache, courtesy of Alice Medrich’s recipe from Chewy Gooey Crispy Crunchy Melt-in-Your-Mouth Cookies . The result is quite tasty. Unless you don’t like cake, oranges or chocolate, or the three together, which would be a bit sad. Mix the following in a small glass jug. I used Guittard’s 61% (cocao solids) semisweet chocolate. First I zap the cream in the microwave until scalding (30 to 60 seconds on high, keeping an eye on it so it doesn’t foam over), then whisk in the chocolate. The heat nicely melts the chocolate without burning it. Best to wait for the ganache to reach room temperature—you don’t want it too liquidy that it’d all run down to the bottom of the cake. Grease and sugar a round 9-inch springform cake pan, with its bottom lined with parchment paper. Preheat oven to 325ºF degrees (I used the convection bake setting). Sift flour and baking powder into a bowl, and set aside. Melt and make brown butter. Stir in orange zest. Set aside to cool and infuse. Whip eggs, sugars and salt until pale yellow, foamy and ribbony. I used the high setting with the whisk attachment on my stand mixer for about 5 to 7 minutes. Fold in flour mixture, followed by the brown butter-orange mixture. You can use a balloon whisk for this, or, gently cheating like I did, continue using the whisk on the stand mixer to gently incorporate the ingredients. For the latter, I do that until things are mostly mixed, then finish incorporating everything by hand with the balloon whisk. I found that sometimes with this combination method I’m less likely to overbeat the ingredients with the balloon whisk. YMMV! Pour batter into pan. Bake for 30 to 35 minutes until golden brown, and when a skewer comes out clean—without wet, uncooked batter. While cake bakes, prepare the orange syrup and ganache. When the cake is done, gently pour the syrup over cake while still warm in the pan. Set aside to cool until at least room temperature before applying the ganache. Remove the cake from the pan, and pour the still liquid (room temperature) ganache over it. Mmmm. This was written by sairuh. Posted on Thursday, February 28, 2013, at 5:56 pm. Filed under Food. Tagged cake, chocolate, oranges, recipe. Bookmark the permalink. Follow comments here with the RSS feed. Post a comment or leave a trackback.